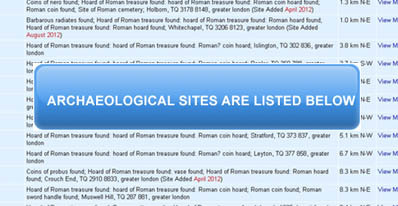 The ARCHI database has found 319 archaeological sites within 10 km of , Rhydycroesau, Shropshire. Data from British Archaeological Records, Historic Sites and Monuments Databases, Local History Sources, Metal Detecting and Treasure Hunting Reports and Archaeology Research Reports. ARCHI has found within 10 km of , Rhydycroesau, Shropshire 38 Roman archaeological / historic / ancient sites and monuments. See below for details of these sites. Roman sites within 10 km SJ2430 Archaeology and Ancient History of Rhydycroesau, Shropshire, British National Grid Reference: SJ2430; E-N: 324000 330000; Decimal Latitude/Longitude: 52.862097, -3.130299 View Old Victorian Ordnance Survey 6 inch to 1 mile Map 1888-1913 of , Rhydycroesau, Shropshire. ARCHI has found within 10 km of , Rhydycroesau, Shropshire 36 Anglo-Saxon archaeological / historic / ancient sites and monuments. See below for details of these sites. Anglo-Saxon sites within 10 km SJ2430 Archaeology and Ancient History of Rhydycroesau, Shropshire, British National Grid Reference: SJ2430; E-N: 324000 330000; Decimal Latitude/Longitude: 52.862097, -3.130299 View Old Victorian Ordnance Survey 6 inch to 1 mile Map 1888-1913 of , Rhydycroesau, Shropshire. ARCHI has found within 10 km of , Rhydycroesau, Shropshire 43 Iron Age / Celtic archaeological / historic / ancient sites and monuments. See below for details of these sites. Iron Age / Celtic sites within 10 km SJ2430 Archaeology and Ancient History of Rhydycroesau, Shropshire, British National Grid Reference: SJ2430; E-N: 324000 330000; Decimal Latitude/Longitude: 52.862097, -3.130299 View Old Victorian Ordnance Survey 6 inch to 1 mile Map 1888-1913 of , Rhydycroesau, Shropshire. ARCHI has found within 10 km of , Rhydycroesau, Shropshire 80 Bronze Age archaeological / historic / ancient sites and monuments. See below for details of these sites. Bronze Age sites within 10 km SJ2430 Archaeology and Ancient History of Rhydycroesau, Shropshire, British National Grid Reference: SJ2430; E-N: 324000 330000; Decimal Latitude/Longitude: 52.862097, -3.130299 View Old Victorian Ordnance Survey 6 inch to 1 mile Map 1888-1913 of , Rhydycroesau, Shropshire. ARCHI has found within 10 km of , Rhydycroesau, Shropshire 48 Medieval archaeological / historic / ancient sites and monuments. See below for details of these sites. Medieval sites within 10 km SJ2430 Archaeology and Ancient History of Rhydycroesau, Shropshire, British National Grid Reference: SJ2430; E-N: 324000 330000; Decimal Latitude/Longitude: 52.862097, -3.130299 View Old Victorian Ordnance Survey 6 inch to 1 mile Map 1888-1913 of , Rhydycroesau, Shropshire. ARCHI has found within 10 km of , Rhydycroesau, Shropshire 4 Post-Medieval archaeological / historic / ancient sites and monuments. See below for details of these sites. Post-Medieval sites within 10 km SJ2430 Archaeology and Ancient History of Rhydycroesau, Shropshire, British National Grid Reference: SJ2430; E-N: 324000 330000; Decimal Latitude/Longitude: 52.862097, -3.130299 View Old Victorian Ordnance Survey 6 inch to 1 mile Map 1888-1913 of , Rhydycroesau, Shropshire. ARCHI has found within 10 km of , Rhydycroesau, Shropshire 2 Mesolithic archaeological / historic / ancient sites and monuments. See below for details of these sites. Mesolithic sites within 10 km SJ2430 Archaeology and Ancient History of Rhydycroesau, Shropshire, British National Grid Reference: SJ2430; E-N: 324000 330000; Decimal Latitude/Longitude: 52.862097, -3.130299 View Old Victorian Ordnance Survey 6 inch to 1 mile Map 1888-1913 of , Rhydycroesau, Shropshire. ARCHI has found within 10 km of , Rhydycroesau, Shropshire 3 Neolithic archaeological / historic / ancient sites and monuments. See below for details of these sites. Neolithic sites within 10 km SJ2430 Archaeology and Ancient History of Rhydycroesau, Shropshire, British National Grid Reference: SJ2430; E-N: 324000 330000; Decimal Latitude/Longitude: 52.862097, -3.130299 View Old Victorian Ordnance Survey 6 inch to 1 mile Map 1888-1913 of , Rhydycroesau, Shropshire. ARCHI has found within 10 km of , Rhydycroesau, Shropshire 22 Unclassified ancient archaeological / historic / ancient sites and monuments. See below for details of these sites. Unclassified ancient sites within 10 km SJ2430 Archaeology and Ancient History of Rhydycroesau, Shropshire, British National Grid Reference: SJ2430; E-N: 324000 330000; Decimal Latitude/Longitude: 52.862097, -3.130299 View Old Victorian Ordnance Survey 6 inch to 1 mile Map 1888-1913 of , Rhydycroesau, Shropshire. ARCHI has found within 10 km of , Rhydycroesau, Shropshire 3 Unclassified historic archaeological / historic / ancient sites and monuments. See below for details of these sites. Unclassified historic sites within 10 km SJ2430 Archaeology and Ancient History of Rhydycroesau, Shropshire, British National Grid Reference: SJ2430; E-N: 324000 330000; Decimal Latitude/Longitude: 52.862097, -3.130299 View Old Victorian Ordnance Survey 6 inch to 1 mile Map 1888-1913 of , Rhydycroesau, Shropshire. ARCHI has found within 10 km of , Rhydycroesau, Shropshire 8 Industrial archaeological / historic / ancient sites and monuments. See below for details of these sites. Industrial sites within 10 km SJ2430 Archaeology and Ancient History of Rhydycroesau, Shropshire, British National Grid Reference: SJ2430; E-N: 324000 330000; Decimal Latitude/Longitude: 52.862097, -3.130299 View Old Victorian Ordnance Survey 6 inch to 1 mile Map 1888-1913 of , Rhydycroesau, Shropshire. ARCHI has found within 10 km of , Rhydycroesau, Shropshire 4 Dark age archaeological / historic / ancient sites and monuments. See below for details of these sites. Dark age sites within 10 km SJ2430 Archaeology and Ancient History of Rhydycroesau, Shropshire, British National Grid Reference: SJ2430; E-N: 324000 330000; Decimal Latitude/Longitude: 52.862097, -3.130299 View Old Victorian Ordnance Survey 6 inch to 1 mile Map 1888-1913 of , Rhydycroesau, Shropshire. ARCHI has found within 10 km of , Rhydycroesau, Shropshire 28 Tithe map data archaeological / historic / ancient sites and monuments. See below for details of these sites. Tithe map data sites within 10 km SJ2430 Archaeology and Ancient History of Rhydycroesau, Shropshire, British National Grid Reference: SJ2430; E-N: 324000 330000; Decimal Latitude/Longitude: 52.862097, -3.130299 View Old Victorian Ordnance Survey 6 inch to 1 mile Map 1888-1913 of , Rhydycroesau, Shropshire.